This past weekend my family celebrated a holiday. Most of you are thinking it was the obvious Cinco de Mayo celebration which, although was indeed Sunday, was not the only holiday of the day. For those of the Greek Orthodox faith it was Easter Sunday and in my house we were making Easter dinner with some Easter treats. I know what most of you may be thinking… Easter was a long time ago but that is not the case for the Greek Orthodox Christians as they follow the old calendar and not the new of the western world. Therefore, some years Easter will coincide and other years it will not. This year was one of those years. With that said I was in the kitchen making lamb and a slew of other yummy’s when I decided to make a new pastry for the family to try rather than the traditional Pasta Flora. I thought I would try a Linzertorte which surprisingly ended up being similar to the Pasta Flora of Greek Easter tradition. Both pastries are more crust/dough then filling, the dough’s are both lemon based, creating a smell I recognized from Pasta Flora as I prepared the Linzertorte. The only noticeable difference at that point was in texture. Lastly, both pastries are filled with a jam center. 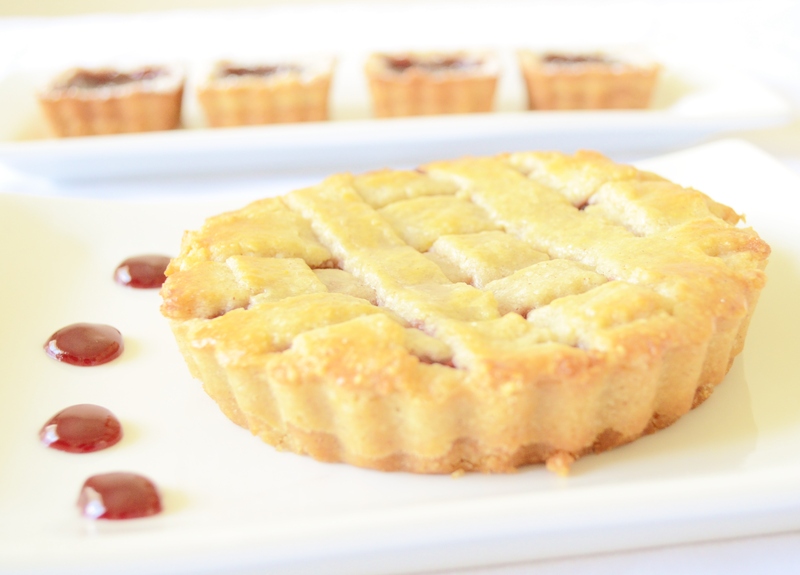 Although these mini Linzertortes are much simpler than the traditional formulas from Austria, it is still a bit more tedious than the Greek Pasta Flora. The crust is made up of hazelnuts and almonds for a balanced nut flavor without bitterness. Traditional formulas ask for a hard boiled egg which is not only bizarre but time consuming. Time which a new mommy doesn’t have!!! Not to mention the hard boiled egg actually does too good a job at making the dough tender. A raw egg moistens the dough and brings it together just fine. For the final touch on the crust, cinnamon and allspice is added for spice. Once mixed up and flavored, the hardest step of the Linzertorte comes next… forming the crust in the tart pan with the rather sticky dough. I found the easiest way to do this is chill the dough until firm yet still malleable. Then divide the dough in two and roll each disk out between plastic wrap to prevent the dough from sticking to the rolling pin. Be sure to chill the dough if at any point it gets too sticky to work with. When laying the lattice strips, be very careful as the dough softens and breaks easily. Also the jam center prevents the strips from being repositioned once initially laid down so study the instructions carefully before laying the first strip as it can be difficult to fix mistakes after beginning. If at any time the lattice strips tear or crack, don’t despair. Just piece them back together the best you can. Once you baste the dough with the cream and sugar, any cracks will be almost unnoticeable after baked. Once out of the oven, the traditional accompaniment is lightly sweetened whipped cream flavored with kirsch or framboise but you can use vanilla if you do not want to use alcohol. Or of course you can skip the whipped cream and eat as is. 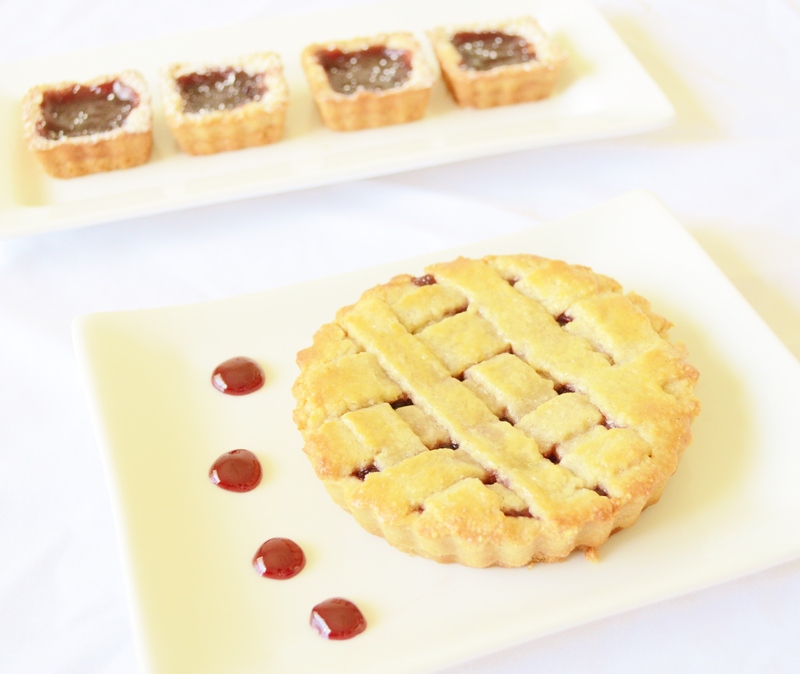 The tarts keep very well for about 2 days at room temperature in a tightly sealed container. The following formula makes two small tarts and one pan of mini tartlets or one 11 inch Tart that serves 10 to 12. For the Pastry: Adjust the oven rack to the lower-middle position and heat oven to 350°. Toast nuts on a rimmed baking sheet, stirring once, until lightly browned and fragrant, about 8 minutes. Cool nuts to room temperature. Do not turn off the oven. In a food processor, pulse cooled nuts, sugar, and salt until very finely ground, about eighteen 1-second pulses. Add lemon zest and pulse to combine. Add flour, cinnamon and allspice and pulse to combine. Scatter the butter pieces over the flour mixture and pulse until the butter lumps are no larger than peppercorns and the mixture resembles coarse meal, about twelve to fifteen 1-second pulses. In a small bowl, whisk lightly to combine the egg and vanilla. With the food processor running, pour the egg mixture through the feed tube and process until the dough forms a large ball, about 10 seconds. Turn the dough out onto a clean work surface and press together to form a cohesive mound. Divide the dough into 2 pieces. Flatten each piece into a disk and wrap in plastic wrap. Chill the dough until firm but still malleable. If not using right away you can keep the dough in the refrigerator for up to 48 hours. Cut a parchment round to fit the tart pan or pans size that you are using. Spray the bottom and sides of the tart pan(s) with nonstick cooking spray. Separate the bottom from the sides of the tart pan(s) and line the bottom with the parchment round and spray the parchment with cooking spray. Roll out the dough into disk(s) between plastic wrap to a size just shy of the edges of the pan bottom. Place the dough on the pan bottom(s) and drop into the fluted ring(s). Using hands, press the dough into an even layer until flush with the sides of the tart pan(s). Using a fork, poke holes uniformly in the dough and set the tart pan(s) on a baking sheet. Bake until beginning to brown around the edges, 15 to 18 minutes. Set the baking sheet on a wire rack and cool to room temperature. Pinch pieces of dough from the remaining disk and roll with hands on a work surface to form a rope. Place the rope against the side of the cool prebaked tart pan(s). Repeat with additional dough (you will have some dough left over for the lattice), connecting the ends of the ropes. When the entire inside wall of the tart pan(s) have been lined, use your fingers to gently press the rope into the flutes of the pan(s), creating walls about 5/8 in. high (walls should not be as high as the rim of the tart pan(s). Set the tart pan(s) aside on the baking sheet. Reshape the remaining dough into either one large 12 in. round if using a large tart pan or two 6 in. rounds if preparing two mini tarts. Dough should be rolled to 1/8 in. thickness between two sheets of parchment sprayed with cooking spray. If the dough becomes too sticky to work with, refrigerate or freeze it until firm but still malleable. Peel off the top layer of parchment. Using a ruler sprayed lightly with cooking spray and a pastry cutter, pizza cutter, or chef’s knife, neaten the edge of the dough round(s), then cut round into strips. You will need 10 strips for each tart. Slide parchment with dough onto a baking sheet and cover loosely with parchment. Freeze for 20 minutes or refrigerate for 40 minutes until firm but not fully stiff. 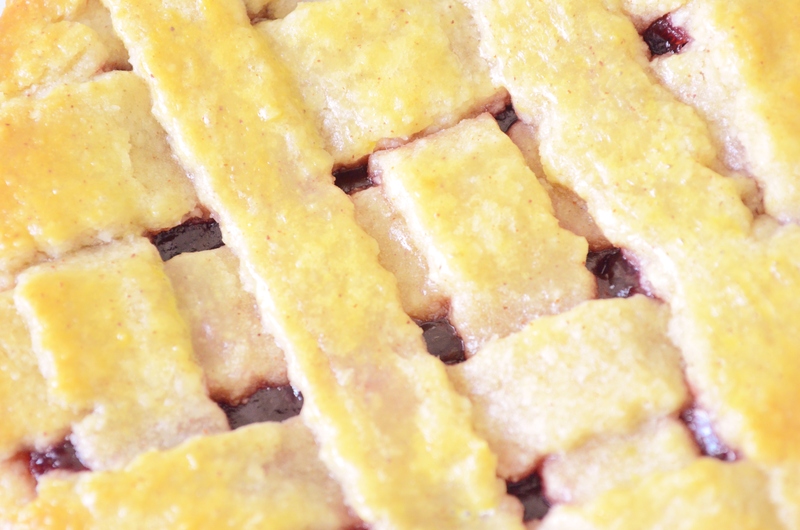 For the Filling: While the lattice chills, in a small bowl stir the raspberry preserves and lemon juice together. 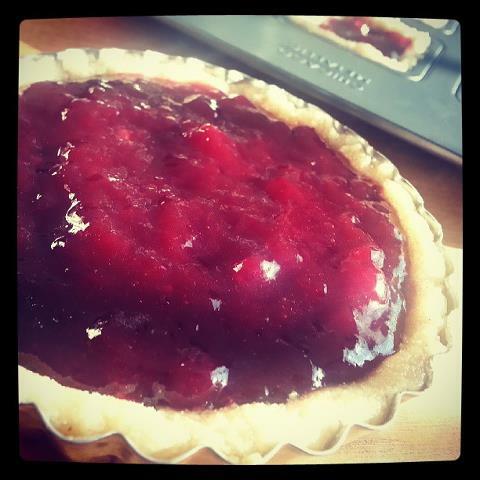 Spread the preserves evenly in the tart shell(s). To Assemble, Glaze, & Bake: Invert the dough strips sandwiched between parchment and peel off the top layer. Using an icing spatula as needed, lift one of the longest strips from the center of the round and lay across the center of the tart at the 1 o’clock/7 o’clock position. Lift the second longest strip and lay across the center of the tart at the 3 o’clock/9 o’clock position. You should have an X formed across the tart at this stage. Lift a short strip and lay across the tart parallel to the first strip, near the edge of the tart. Working clockwise, repeat the positioning of outer strips parallel to the central strips. There should now be 6 strips in place. Lift one of the remaining strips and lay across the tart parallel to and equidistant from the central and edge strips. Working clockwise, repeat until lattice is complete with 10 strips. 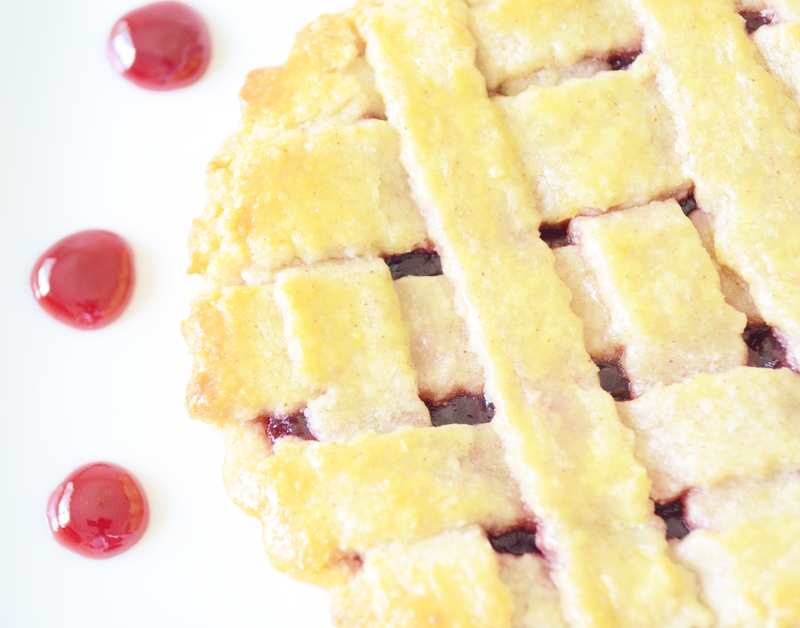 Press any excess dough against the rim of the tart pan to neatly trim. Repeat process with remaining tart if making two mini tarts. Gently brush lattice strips with heavy cream and, if using, sprinkle with sugar. Bake tart(s) on baking sheet until deep golden brown, about 50 minutes for one large tart or 20 minutes for mini tarts. Cool on baking sheet on wire rack to room temperature, about 2 hours. To Serve: Remove outer tart pan ring. Slide a thin metal spatula between parchment paper and bottom of crust to loosen. Slide tart onto serving platter. Cut into wedges and serve with flavored whipped cream if desired.